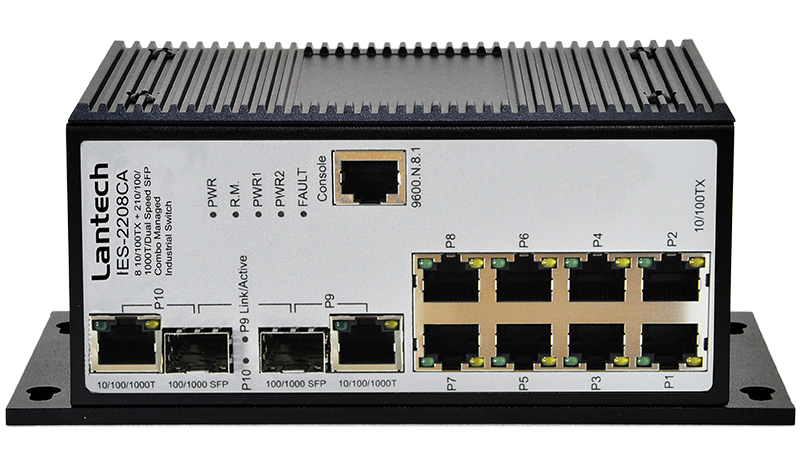 The Lantech IES-2208CA-DNV is an 8-port 10/100BaseTX + 2-port 10/100/1000T/Dual Speed SFP Combo industrial switch with Pro-Ring2se self-recovery scheme in 20ms. The SFP connection is suitable with 100M or 1000M Dual Speed. The advanced SNMP management features include QoS for 4 queues, 802.1q VLAN, IGMP snooping, query and source only for multicast IP surveillance, DDM*** as well as Web Ping,CPU load monitoring, SNTP and SMTP etc.